A militant crowd of approximately 500 protesters marched in opposition to austerity Monday night, provoking a swift and aggressive response from the dozens of riot police officers. 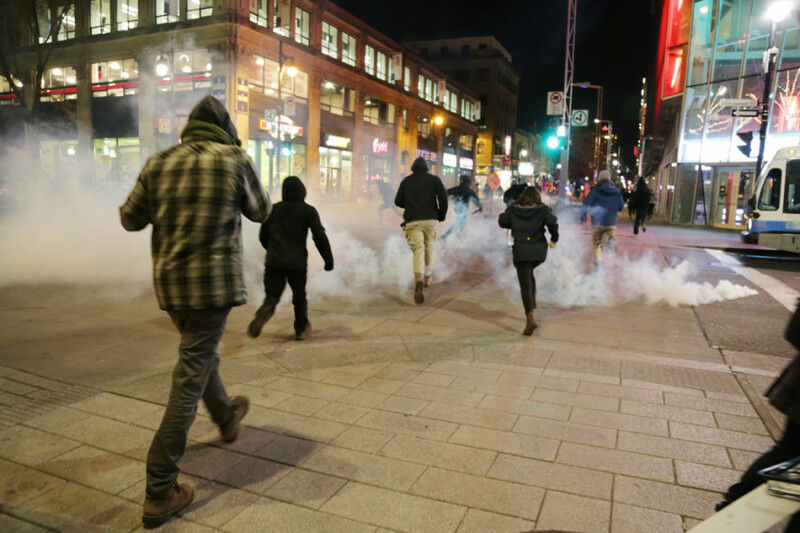 The evening ended with at least one confirmed arrest, a small fire, and the smell of tear gas filling the cold nighttime air in downtown Montreal. The demonstration comes after reports last week suggested the Liberal-majority government and provincial labour unions were close to a new collective agreement. Cited as an “act of good faith,” the Common Front—which represents 405,000 of 500,000 Quebec public sector workers—postponed protests scheduled for the first three days of December. 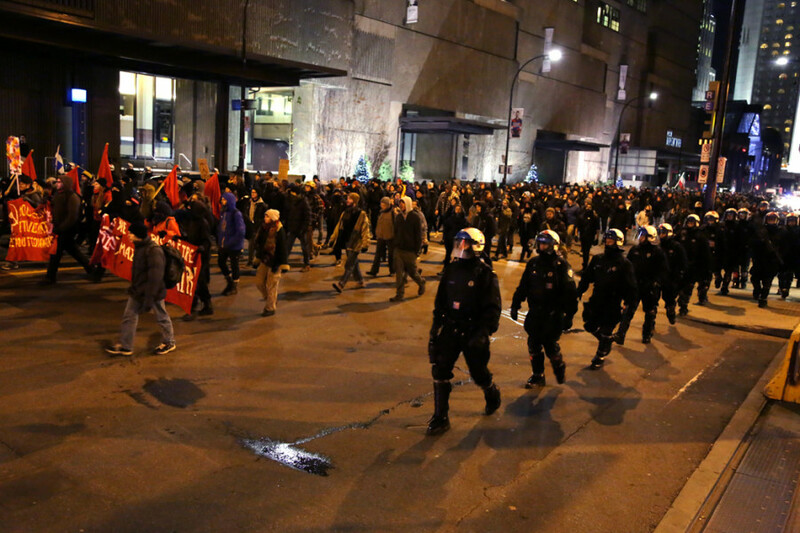 The protesters gathered at Phillips Square and began marching through downtown at around 8:30 p.m. The group moved at a quick pace through the street as riot police flanked them on the sidewalks. The situation escalated as the march approached de Bleury St. Several rocks were thrown at riot police, which led the officers to take a more aggressive stance. A young hooded man approached the officers with his middle finger raised, and was quickly grabbed, struck in the chest with a baton, and dragged behind the police line. 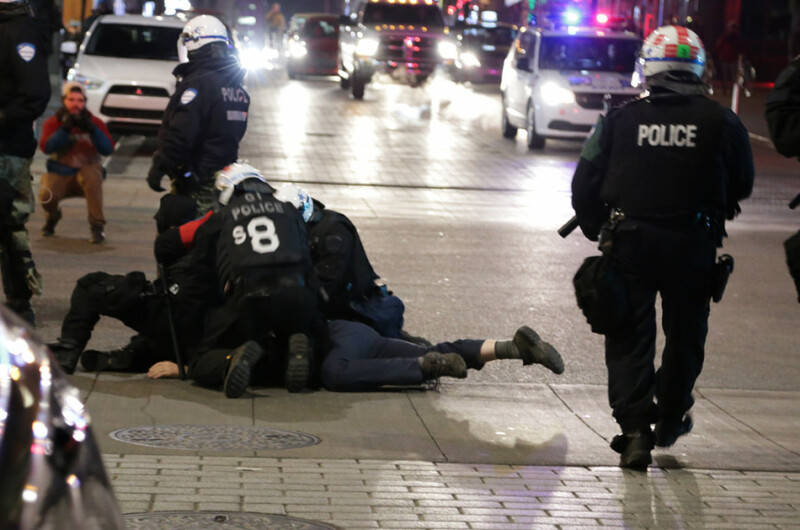 In addition, an SPVM spokesperson said that an 18-year-old woman was arrested for allegedly assaulting a police officer. She was taken to a hospital to treat a head injury, which witnesses say she may have sustained while being tackled by police. A second arrest was made of a 23-year-old man for hindering police operations. The tense standoff continued on the intersection of de Bleury St. and Ste. Catherine St., and a number of protesters threw fireworks and stink bombs at police. Shortly thereafter, an announcement was made over a loudspeaker that the assembly was unlawful, and a dispersal order was given. The march quickly resumed eastward as riot police reinforcements began to arrive, and officers gave chase. Moments later, police deployed tear gas in the direction of the crowd, which dispersed into smaller groups. About four dozen riot cops continued to chase down the small pockets of remaining demonstrators, firing off about half a dozen tear gas canisters in the process. The march’s numbers eventually dwindled, but a small contingent eventually made its way to St. André St., between de Maisonneuve Blvd. and Ste. Catherine St. There, three hooded protesters set fire to piles of recyclable material that had been dragged onto the street and ran off. A lighthearted moment arose from the blaze, as two police officers arrived and looked on at the burning material. One protester shouted “if you hit it with your baton, maybe the fire will be more cooperative.” The officers smiled and laughed at the remark, before putting out the fire with an extinguisher. Firefighters arrived on the scene within about 10 minutes and contained what was left of the small blaze. There were no reports of damage from the fire. 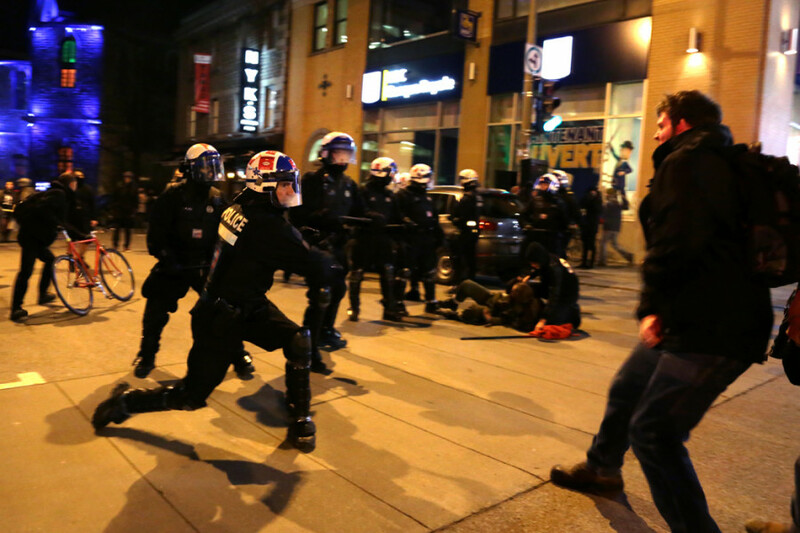 Police also say that two windows were broken by protesters over the course of the evening: one belonging to a police vehicle, and the other at a Banque Laurentienne branch on the corner of Ste. Catherine St. and Wolfe St., near Beaudry metro station.